As we get more and more projects added to TC finding the right one gets more and more difficult as they are all displayed in a single level in a somewhat random order. It would be nice if TC allowed me to group projects into categories. For example I might want to put all components in one group, all applications in another, or I might want to group them by development department, etc. Also currently there does not seem to be any defined order of display. It would be nice if I could decide if the order is alphabetical or in specified order. think about ability to archive projects instead of grouping? We currently have 10 active projects managed by TC with about 4-6 build configurations each. We have about 50 active projects with 1-3 build configurations and it is not limit. Archive projects is good functionality, but our projects are active. 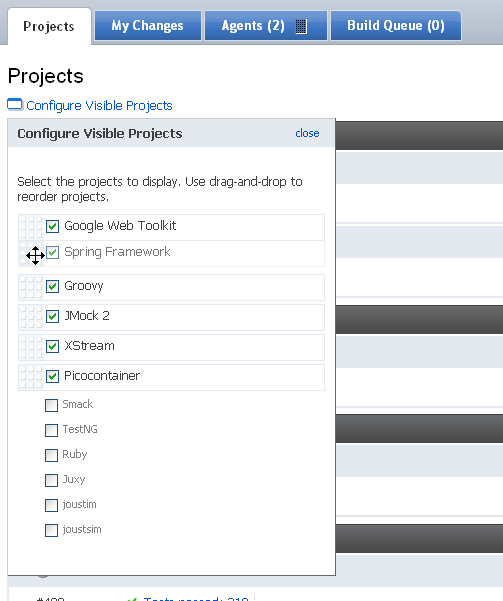 Actually, overview page allows to customize the set of visible projects and their order (See "Configure Visible Projects" link which opens a pop-up with projects list). As Pavel noted, this is not possible in the Administration area, however. IMHO this makes sense: this is the place where all the projects of the server are listed no matter what user preferences are. Per-project permissions that will be available in TeamCity 3.0 should improve the situation a bit: user will only see the projects he/she has permission to view/administer.